The rise of PHP has seen it spawn numerous web application development frameworks. One of the best ones to see the light of the day is Yii. The Yii framework is totally object-oriented and component-based making it a favored choice for developers across the world. Besides, it comes with substantial and thorough documentation and tutorials so that new developers can get the hang of the fundamentals. At GoodCore, we developed seamless familiarity with the Yii development framework, and used agile web development in many projects to achieve success in very short timeframes. This has made us one of the leading Yii development companies in Malaysia. 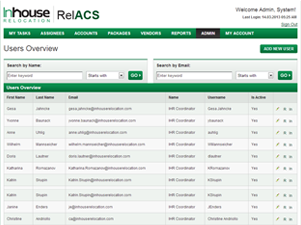 RelACS is an Assignment Tracking & Coordination System designed for InHouse Relocations, a leading Relocation & Move Management Company in Germany. The system is designed to assist the Coordinators in terms of capturing and tracking individual Assignment records related to tracking assignment data or processing assignee expense reports. Our client wanted to build a product for radio show hosts to organize their show prep data for the digital age. This data includes the stories covered by radio show hosts, their notes, their audio — all in a digital environment accessible via web. It is web-based solution that enables large business organizations to manage everything about their customer briefings and meetings. The system enables multiple users to manage and update briefing schedules, staff and assignments. Developed on the basis of MVC (Model-View-Controller) design principle using the high performance PHP YiiFramework. There are many advantages to opting for the Yii framework. It speeds up PHP application development, and comes with features like DAO/ActiveRecord, caching, themes, widgets, web services, hierarchy, internalization, localization and many more. This helps in web 2.0 application development that is the norm of the day. Available under the new BSD license, the Yii framework is free to use. It is very easy to create a clean and reusable code structure with a distinct demarcation between logic and presentation layers of the MVC architecture. You can hire Yii developers from GoodCore to catalyze the development of your web application. Our team of Yii developers can create seamless web apps for you, that are stringently tested to be devoid of bugs, and will continue to function without any glitches for years to come. Being one of the leading Yii development companies in Malaysia, GoodCore provides cost-effective Yii development services. Call us today for a free consultation and to experience the GoodCore advantage!